A few weeks ago I was scrolling through my Facebook news feed, and the above picture caught my attention. 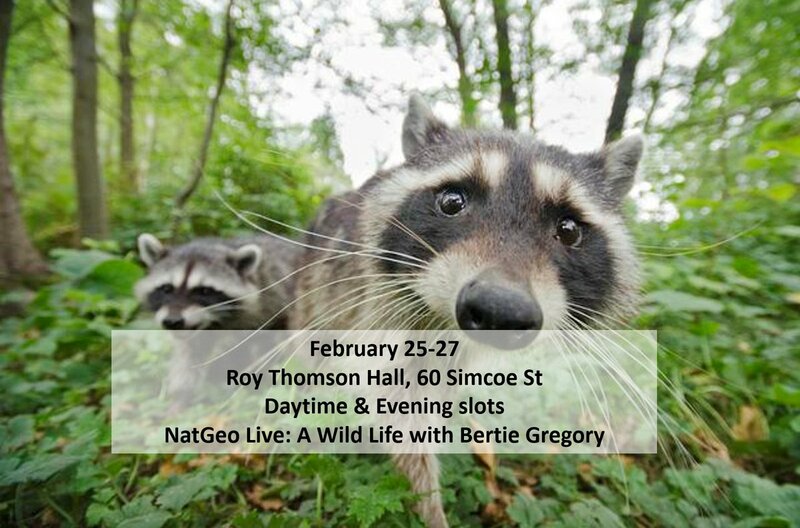 It was an ad for a National Geographic Live event, as part of their series, taking place at Roy Thomson Hall. As our backyard has played host to many raccoon families over the years, and my husband "has a thing" for them, I clicked on the ad to see what it was all about. Wildlife photographer and filmmaker, Bertie Gregory, was giving a presentation about his life and work with wildlife. He's been to many exotic places and has filmed some amazing animals. But a lot of this presentation was going to be about some Canadian wildlife on the coast of Vancouver Island. Rob and I had never attended anything like this before, but I was intrigued. 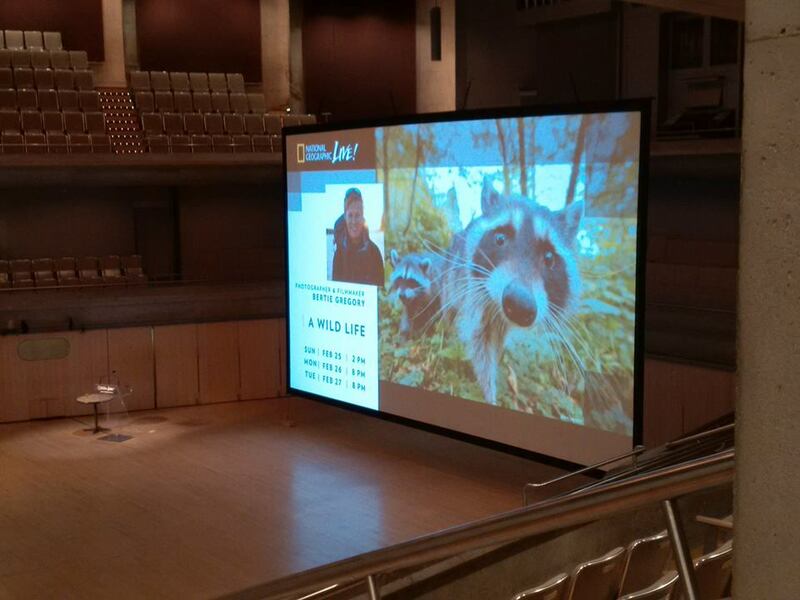 After talking with Rob about it, two tickets were purchased for the first of his three presentations here in Toronto. February 25th, waiting for the presentation to start. We really had no idea what to expect, but I know I didn't expect to walk away feeling like I had just been on a wildlife roller-coaster. Bertie was engaging, his stories riveting, humorous, and sometimes heartbreaking. I was on the edge of my seat during some of the presentation. His photography and videos were breathtaking, but even that wasn't what impressed us the most, it was Bertie himself. Throughout the presentation he slipped in issues that need to be addressed. The importance of co-existing with our wildlife, and conservation. The animals (subject) safety being 100% the priority, not the product (picture/film). Hearing him speak words that Rob and I believe so passionately was spirit lifting. We stayed after the presentation for the Q & A. Bertie really has had a fairy tale start to his career, but that's better told by him. Click here for his website to learn more about him and his work. I also slipped him a note with a couple Peregrine Falcon nest site locations here in the city and told him where he could see some Snowy Owls if he had time. Happy to report he did get to see one of our Peregrine Falcons during his stay. 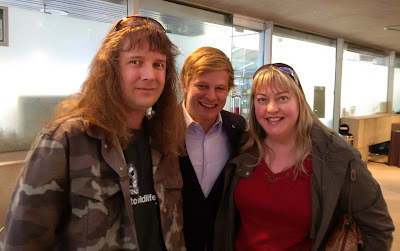 Rob and I with Bertie Gregory. Since the presentation last week I have started watching his series wild_life with Bertie Gregory on YouTube, shot off the coast of Vancouver Island.Very enjoyable series, educational, funny and sometimes thought provoking. Bertie is very charismatic, honestly, you just want to take the guy out for a pint and talk nature and wildlife. The passion he has for what he does and the respect for his subjects is undeniable. We look forward to following his career. Thanks for the heads up, Angie. My husband and I can't get enough of wildlife shows so we will definitely check out Bertie's web series.